July 2-6, 2009 – $499 Single Order. $749 for two. Couple Order. This tour starts July 5th. You should arrive in Quito July 3rd. Spend the night in Quito. (We’ll make the reservations at a 5 star hotel for a 2 star price.) The tour starts July 4th in Quito when you travel to Cotacachi and visit markets July 5th, 6th and 7th. Join our Ecuador Export Tour hosted by our staff and delegates who have attended previous courses and are exporting from Ecuador now. This tour visits the main export markets around Cotacachi and Otavalo, Ecuador markets. Meet the artists, designers, creators, craftsmen, wholesalers and visit them in their workshops, homes and markets. Improve the quality of your life, expand your horizons and reduce the tax you pay as you increase asset protection by having an overseas company and overseas income! Join other like minded souls in Ecuador. Learn how to gain freedom and self fulfillment through an Ecuador export business. See Ecuador export potential in Ecuador. And all types of exports. This tour goes to the high Andes. You’ll see products from Zuleta where they create handmade “green” cotton-one-of-a-kind tableware, shirts, specialty items. 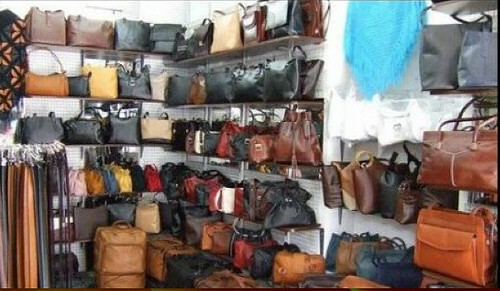 You’ll travel everyday to see different markets, crafts people and masters who create special products that will make your eyes gleam with delight…both for their uniqueness and attraction. In addition, over the years we’ve combined this knowledge and experience with contacts in the form of American and European readers who now live and work in Ecuador. Working with them we have set up office and business facilities to create an export support service that we can now offer to you. Alberto Verdezoto and our staff, plus delegates who have attended our tours and regularly export from Ecuador will guide you. Here is Alberto Verdezoto guiding one of our previous tours. You could not be in better hands. 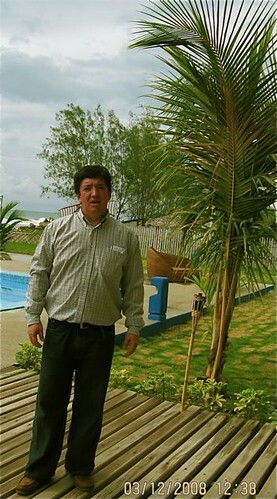 Alberto was in the Ecuador travel business for more than 10 years and has been our main real estate researcher for three years plus has helped conduct all our previous export expeditions. We have even purchased a 180 year old hacienda that is a charming hotel to turn into your business center! Here’s the hotel. This is where we will conduct the course when we are not visiting markets. Rooms are only $59 a night + tax. Plus we have an experienced English-Spanish speaking business people who live here and can act as your local backup for the business. This combination makes it possible for you to have your own Ecuadorian import/export business, which can be run from your home or in your own Ecuadorian hideaway you’ll be able to buy with your extra profits. Timing for such a business has never been better! Exporting has already created fortunes for a few entrepreneurial individuals. Now because of our knowledge, experience and contacts, a special business is available for you. Until recently, operating an overseas business took a great deal of time and effort to start. This is no longer true. Technology makes it possible to take your business where opportunity is best and allows you to run this business from anywhere in the world. You can run your export business from an office or at home! The internet makes this more possible than ever before and at the course we’ll share ideas on how to develop and use your website to enhance sales. The internet is the Colt 45 of business, the great equalizer. If you choose to have your own import-export business you too can let the internet help your business grow for wealth and freedom. The Ecuador Export Expedition lets you visit the markets plus entitles you to a $499 discount when you attend any of our International Business Made EZ courses that teaches the marketing theory of exporting and running an internet business. The International Business Made EZ course that I conduct is designed to teach the marketing end of Ecuador exports. The tour which takes place separately gives you hands on experience in the actual markets. You can attend our International Business Made EZ course before or after you join the export tour. This export tour last three days. Because Merri and I will not be on this tour we have reduced the fee from our normal $999 – $1,399 to only $499 or $749 for a couple. You will learn directly from the contacts we introduce to you. Then you can join Merri and me before or after the tour at one of our International Business Made EZ courses. The Business Made EZ course mission is to help you learn how to start, organize and develop your own internet business that can help you in publishing, exports or any type of business. #1: Can be sold to easily identified markets. #2: Can be marked up many times while allowing a fair trade for the indigenous. #3: Can be imported in a suitcase. The tour lets you see in a practical way how to achieve the goals we teach in the course. On the tour you learn from tour leaders who have practical experience from the shipments that they have actually incurred in their own Ecuador export business. Which products? On the tour you visit carved wood, architectural and decorative woods designs in San Antonio de Ibarra. Here is one of the vendors in Otavalo photographed by delegates at an Import-Export course. Paintings from all over Ecuador. Here is an example of one type of art that a previous course delegate is having made from recycled paper and a metallic paint. Their Reiki symbol line of art is sold as fast as they c0uld get it produced. Here are flowers I imported that were grown in Imbabura. I regularly import roses from Ecuador at a fraction of the price you normally pay. 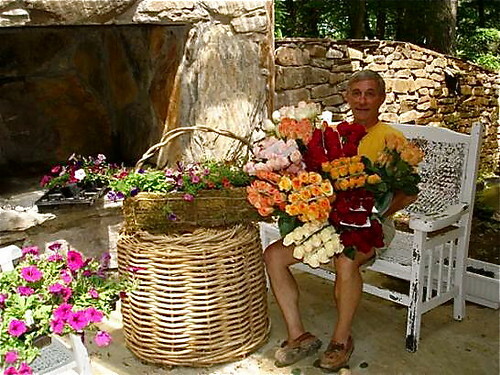 Here I am with 250 roses we had delivered to our home in North Carolina for our own home. You will visit many of these places and more so you can start your business directly from the tour. Before or after the tour, you can attend our International Business Made EZ course (at a $499 discount) to learn the fundamentals, where you have visited these places, seen the goods and met contacts who can back you up (or even act as a joint venture partners). Learn how to enjoy the finest things in life because of international friendships plus how to develop them. We have developed contacts with top Ecuador businessmen, bankers, accountants, attorneys, marketing experts, business consultants, agents all over the country that can help you, large or small, full or part time. There you have it, valuable contacts and knowledge about timely and fulfilling business opportunities that you can cash in on now. Regardless of whether you want your business to make millions, or just add excitement and adventure in your life, to reduce tax or even live abroad, the Ecuador Export Tour can help you get involved with something you love and turn after tax costs into tax deductible expenses. Whether you have a successful business, want a part time business for change or as job security, this course can be of enormous value to you. The three day course can be combined with our International business and investing courses or taken on its own. The $499 is nominal compared to the incredible education you gain and the importance of the knowledge for you and your family’s wealth now. 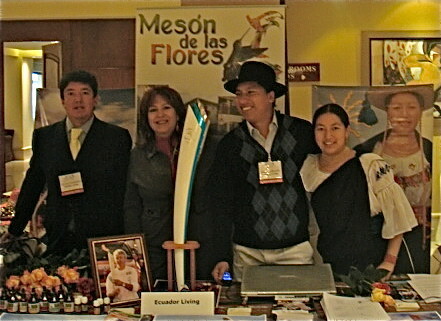 Our business of selling Ecuador products is still going well. We are now appointing Agents across Australia and should have the whole country covered by mid-August. Our initial shops continue to re-order on a regular basis. The best shops seem to re-order every two weeks. We have also received inquiry to provide buying services for people in a few other countries. So we will be seriously thinking about starting our own brand name to market globally. If successful, it should help many Ecuadorians. 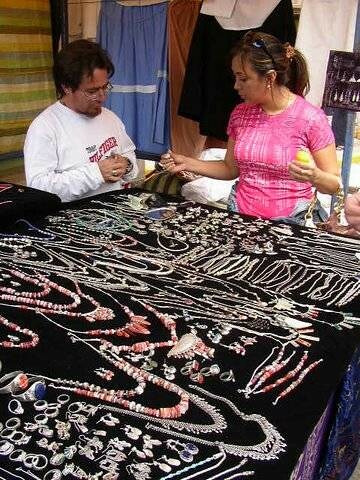 Another couple who attended this expedition sell the goods they export at flea markets. They wrote: Good Evening Gary/Merri. 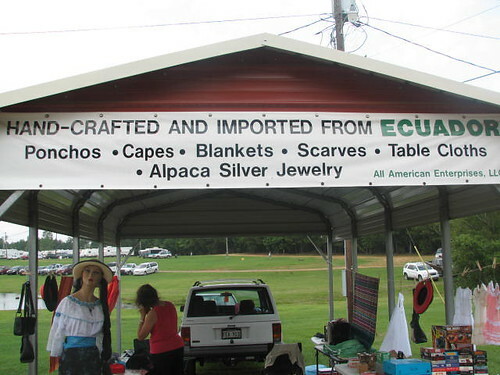 Speaking of a small business, we have opened All American Enterprises, LLC (AAE) which includes selling products from Ecuador at a trade days operation about 200 miles East of Dallas. I don’t know if we are off to a “bang” but we are sure having fun. See attached pictures to include our model Consuela trying to look indigenous. Please tell Merri we have made profit on our inventory and the big sellers are alpaca silver jewelry and Octavalo alpaca ponchos. We will visit at the end of September and would like to restock to include blankets/ponchos/throws from Hilana. Space makes it impossible to explain everything in the course, but I am convinced if you try it, you will find it improves your entire way of life! There has never been a time when the risk of higher tax, greater unemployment and investment dangers were higher in North America , but neither has the opportunity for small businesses abroad been so outstanding. Here is one of the silver workers we visit. 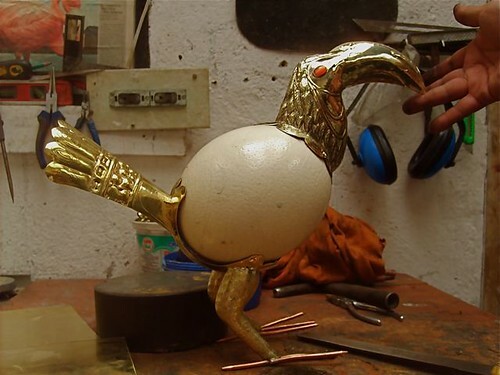 Another jewelry workshop does interesting work in silver and ostrich eggs! 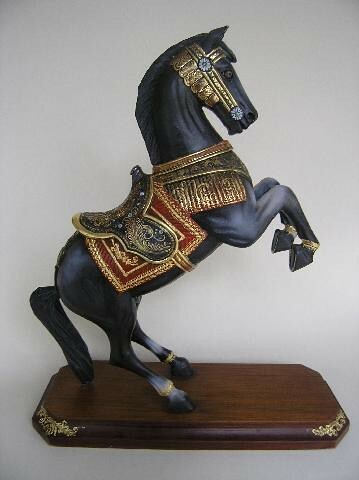 Another craftsman does incredible wood carvings covered in gold leaf like this horse. 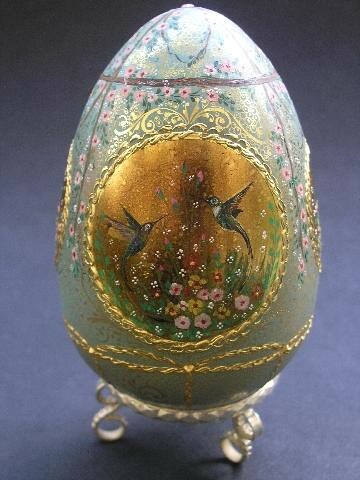 and incredible gold and bejeweled wooden Faberge egg. Recently Gary recommended a printer in Cotacachi, Ecuador, for me to use to print my photographic greeting cards. I was quite skeptical about doing business in Ecuador, both for the hassle of sending money, shipping the product, and most importantly the quality of the printing. As a photographer, I am quite picky about printing. But, after three years of good experience with Gary, I decided to take another risk and try the printer. The results were outstanding–better than many press jobs I’ve seen in the US, and the price was terrific. I’ve learned that Gary likes to push his students to try things they thought were too risky. Gary lives on the cutting edge. But, interestingly enough, I don’t think he is really a risk-taker, because his feet are always firmly planted on the ground. I’ve learned over time that I can trust Gary’s thinking, and that he really does come up with some unusual, and very effective, solutions to problems that I’ve tried to solve on my own. My suggestion is simply to try out Gary. You may have to risk some money, but my experience has been so positive that feel safe in saying that the risk will be well worth it. Of the $1000 or so that I invested , I have earned many thousands in return, and have created a lifestyle for myself that is far more fulfilling than anything I had previously. 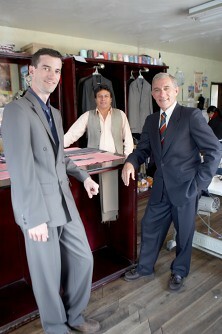 Here I am with Todd Smith trying new tailor made Ecuador suits that cost $135 to $200…an excellent Ecuador export. Expand your borders now! Increase your economic security freedom, independence and success. Gain a fortune, enjoy life more and help those who are less fortunate. My name is Bonnie Keough. 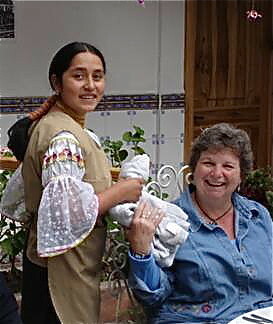 In March 2006, I went to Ecuador to attend Gary and Merri’s import/export course. I was hoping to find items to bring back to the States and sell. I love to travel and was looking for business ideas that would enable me to do that. I had never been to South America (never even considered it) before so it was an adventure. I didn’t know what to expect, but I had been reading Gary’s newsletter for a while and I was impressed with the Scott’s honesty and integrity. They don’t promise overnight success or try to sell you a business opportunity. They share their wealth of experiences, open doors for you and educate you on the possibilities and opportunities available. It’s up to you to implement what you learn. I found so much more than high quality products in Ecuador, the people I deal with are kind, hard-working folks who truly appreciate my business and I appreciate their honesty and skills. I have returned to Ecuador 6 more times since my first trip and each time I leave I’m anxious to return. I always personally select all of the items I sell. By doing this, I’ve learned a lot about quality, prices and sources and I enjoy interacting with the people. But it is hard work and not everyone enjoys that aspect of the business. You will have to decide how much you want to participate. Don’t expect to find mass produced items in Ecuador. If you have an idea for a product, it is a great place to have items custom made. It’s possible to find high quality labor intensive pieces, such as hand knit sweaters or hand woven rugs, at very reasonable prices. If you have a genuine interest in pursuing an import business, whether in Ecuador or elsewhere, I’m sure you will benefit from the import course. It’s a great introduction to the country and opportunities available there and provides a background on the nuts and bolts of the business. It opened a doorway to a new life for me. We stress that this is a course combining theory and practicality…but this is a true expedition! You’ll be having fun as you view products, interview, bargain, meet, search and many will even buy. Those who are just looking for a “classroom experience in a hotel” should not attend. Everyone will be out in the field looking and examining and finding. Bonnie. Enroll in our Ecuador Export tour today.